Successful medical treatment of the primary disorder in cases of splenomegaly can lead to regression of the hypersplenism without the need for surgery. Inpatient care for patients with splenomegaly depends on the modality used to treat the underlying cause of the condition and on the complications of that care. These therapies are not unique to splenomegaly treatment and, therefore, are not discussed here. Outpatient care of patients with splenomegaly consists of three main focus areas: (1) primary etiologic disease; (2) blood count monitoring, especially when associated with a myeloproliferative disease as the cause; and (3) monitoring for overwhelming postsplenectomy infection (OPSI). Thrombocytosis may require treatment when the platelet count exceeds 1 million/μL. Multiple modalities have been used to reduce the platelet count or inhibit their thrombotic effects, including hydroxyurea, aspirin, or plateletpheresis (collection and removal of platelets from the circulation). No randomized, placebo-controlled studies have demonstrated a better survival benefit with one therapy over the other. Whether any discrete benefit is gained by also controlling the platelet count remains unclear. Such centers usually have the additional resources (eg, a well-stocked blood bank, a tertiary level intensive care unit) to support the organ systems in these patients. Multisystem organ failure is not uncommon following severe hemorrhage, and these patients are no exception. Consultation with a hematologist is ideal before surgery for enlarged spleens in order to secure necessary blood products. Postoperative management does not usually require intervention from a hematologist. The usual postoperative activity restrictions imposed on a patient who has undergone a laparotomy or laparoscopy also apply to patients after a laparoscopic splenectomy. Patients with uncorrected splenomegaly should be counseled to refrain from contact sports or activities that would predispose them to blunt abdominal trauma. Examples include skydiving, horseback riding, soccer, football, and ice hockey. These restrictions reduce the likelihood that blunt injury will lead to splenic rupture and uncontrolled hemorrhage. Chemotherapy is used for hematologic malignancies. Antibiotics are used for infection, with the exception of infection associated with a splenic abscess; this requires surgical intervention. Immunosuppression is used for autoimmune or inflammatory disorders, treatment of cirrhosis, and CHF. All patients scheduled for elective splenectomy (either diagnostic or therapeutic) should receive a pneumococcal vaccine. Also consider administering prophylaxis against Haemophilus influenzae and Neisseria meningitidis. 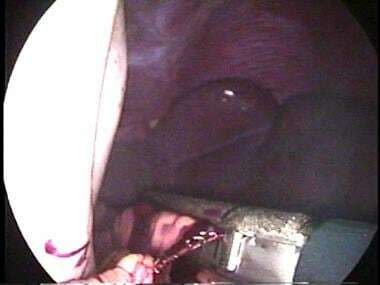 Intraoperative photograph of a laparoscopic splenectomy being taken down using the hanging-pedicle technique. The tip of the spleen is visualized in the background, whereas the stapler is detailed in the foreground across a segment of the pedicle. Massive splenomegaly does not preclude splenectomy through a minimally invasive approach. 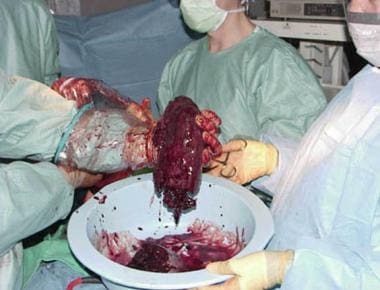 This photograph depicts a fragmented 3.2 kg (7.05 lb) spleen after removal via a hand-assisted laparoscopic technique. 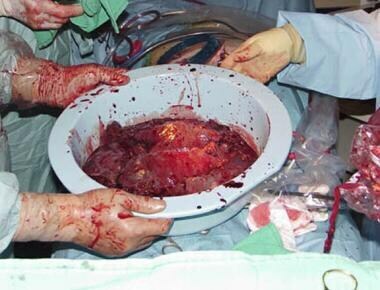 A portion of a massive spleen is extracted via hand-assisted laparoscopy. Occasionally, a reactive thrombocytosis occurs following splenectomy. Thrombocytosis in the face of splenectomy rarely requires treatment. It is most common in patients with massive splenomegaly from myeloproliferative disorders. An onset of fever several days following splenectomy can be due to a recrudescence of malaria. This should be considered as a cause of fever in patients who have lived in areas commonly associated with malaria and in persons who abuse intravenous (IV) drugs who share needles. With Plasmodium malariae infection, this may occur decades after the initial infection. Malaria from P vivax (3-7 y) and P falciparum (about 1 y) remain active for shorter intervals after the initial infection. Fulminant, life-threatening infection represents a major long-term sequela after splenectomy in patients with splenomegaly. Splenic macrophages play a major role in filtering and phagocytizing bacteria and parasitized blood cells from the circulation. In addition, the spleen is a significant source of antibody production. Overwhelming postsplenectomy infection (OPSI), also known as postsplenectomy sepsis syndrome, begins as a nonspecific, flulike prodrome that is followed by a rapid evolution to full-blown bacteremic septic shock—accompanied by hypotension, anuria, and clinical evidence of disseminated intravascular coagulation—thus making this syndrome a true medical emergency. The subsequent clinical course often mirrors that of the Waterhouse-Friderichsen syndrome, with bilateral adrenal hemorrhages noted at autopsy. Despite appropriate antibiotics and intensive therapeutic intervention, the overall mortality rate in older published studies of established cases of OPSI varied from 50-70%. Information now suggests, however, that if patients seek medical attention promptly, the mortality rate may be reduced to approximately 10%. Of those patients who die, more than 50% do so within the first 48 hours of hospital admission. Most instances of serious infection are due to encapsulated bacteria, such as pneumococci (eg, Streptococcus pneumoniae). Because these organisms are encapsulated and the spleen is integral in the removal of opsonized bacteria, affected patients are at increased risk for unimpeded sepsis. Pneumococcal infections account for 50-90% of cases reported in the literature and may be associated with a mortality rate of up to 60%. H influenza type B, meningococci, and group A streptococci account for an additional 25% of infections. Possible OPSI involving an asplenic individual constitutes a medical emergency. The critical point in management remains early recognition of the patient at risk, followed by subsequent aggressive intervention. The diagnostic workup should never delay the use of empiric therapy. Possible choices of empiric antimicrobial agents include cefotaxime (adult dose of 2 g IV q8h; pediatric dose of 25-50 mg/kg IV q6h) or ceftriaxone (adult dose of 2 g q12-24h; pediatric dose of 50 mg/kg IV q12h). Unfortunately, some penicillin-resistant pneumococcal isolates are also resistant to cephalosporins. If such resistance is suggested, consider using vancomycin. The precise incidence of OPSI remains controversial. Overall, the most reliable data related to incidence estimate approximately 1 case occurring per 500 person-years of observation. Asplenic children younger than 5 years, especially infants splenectomized for trauma, may have an infection rate of greater than 10%. Splenectomy performed for a hematologic disorder, such as thalassemia, hereditary spherocytosis, or lymphoma, appears to carry a higher risk than splenectomy performed as a result of trauma. A major contributing factor is the frequent existence of splenic implants or accessory spleens in traumatized patients, although accessory spleens can also be seen as a developmental anomaly. Preventative strategies for OPSI fall into 3 major categories: education, immunoprophylaxis, and chemoprophylaxis. As previously mentioned, education represents a mandatory strategy in the prevention of OPSI. Asplenic patients should be encouraged to wear a Medi-Alert (Pinellas Park, Fla/Henderson, Nev) bracelet and carry a wallet card explaining their lack of a spleen. Patients should also be aware of the need to notify their physician in the event of an acute febrile illness, especially if it is associated with rigors or systemic symptoms. Vaccination is also appropriate in the prevention of OPSI. This has best been defined for S pneumoniae. Unfortunately, the most virulent pneumococcal serotypes tend to be the least immunogenic, and evidence indicates that the efficacy of the vaccine is poorest in younger patients, who would be at higher risk. However, under ideal conditions in a healthy, immunocompetent host, the vaccine offers a 70% protection rate. The pneumococcal vaccine should be administered at least 2 weeks before an elective splenectomy. If the time frame is not practical, the patient should be immunized as soon as possible after recovery and before discharge from the hospital or, at the latest, 24 hours following the procedure. Most authorities recommend antibiotic prophylaxis for asplenic children, especially for the first 2 years after splenectomy. Some investigators advocate continuing chemoprophylaxis in children for at least 5 years or until age 21 years. However, the value of this approach in older children or adults has never been adequately evaluated in a clinical trial. A major concern is antibiotic use in splenectomized patients. Those who have undergone splenectomy should receive antibiotic prophylaxis prior to undergoing procedures associated with a risk of transient or sustained bacteremia. Antibiotics should cover encapsulated organisms and organisms likely to be found at the operative site. Chapman J, Bhimji S. Splenomegaly. 2017 Jun. [Medline]. [Full Text]. Eichner ER. Splenic function: normal, too much and too little. Am J Med. 1979 Feb. 66(2):311-20. [Medline]. Poulin EC, Mamazza J, Schlachta CM. Splenic artery embolization before laparoscopic splenectomy. An update. Surg Endosc. 1998 Jun. 12(6):870-5. [Medline]. Ginzel AW, Kransdorf MJ, Peterson JJ, Garner HW, Murphey MD. Mass-like extramedullary hematopoiesis: imaging features. Skeletal Radiol. 2011 Nov 20. [Medline]. Arakawa Y, Shimada M, Utsunomiya T, Imura S, Morine Y, Ikemoto T, et al. Bevacizumab improves splenomegaly and decreases production of hyaluronic acid after L-OHP based chemotherapy. Anticancer Res. 2014 Apr. 34(4):1953-8. [Medline]. Koduri PR, Kovarik P. Acute splenic sequestration crisis in an adult with sickle beta-thalassemia. Ann Hematol. 2006 Sep. 85 (9):633-5. [Medline]. O'Reilly RA. Splenomegaly in 2,505 patients at a large university medical center from 1913 to 1995. 1963 to 1995: 449 patients. West J Med. 1998 Aug. 169 (2):88-97. [Medline]. Butler JR, Eckert GJ, Zyromski NJ, Leonardi MJ, Lillemoe KD, Howard TJ. Natural history of pancreatitis-induced splenic vein thrombosis: a systematic review and meta-analysis of its incidence and rate of gastrointestinal bleeding. HPB (Oxford). 2011 Dec. 13(12):839-45. [Medline]. [Full Text]. Zhu JH, Wang YD, Ye ZY, Zhao T, Zhu YW, Xie ZJ, et al. Laparoscopic versus open splenectomy for hypersplenism secondary to liver cirrhosis. Surg Laparosc Endosc Percutan Tech. 2009 Jun. 19(3):258-62. [Medline]. Anegawa G, Kawanaka H, Uehara H, Akahoshi T, Konishi K, Yoshida D, et al. Effect of laparoscopic splenectomy on portal hypertensive gastropathy in cirrhotic patients with portal hypertension. J Gastroenterol Hepatol. 2009 Sep. 24(9):1554-8. [Medline]. Motta I, Filocamo M, Poggiali E, Stroppiano M, Dragani A, et al. A multicentre observational study for early diagnosis of Gaucher disease in patients with Splenomegaly and/or Thrombocytopenia. Eur J Haematol. 2015 Jun 1. [Medline]. Olson AP, Trappey B, Wagner M, Newman M, Nixon LJ, Schnobrich D. Point-of-care ultrasonography improves the diagnosis of splenomegaly in hospitalized patients. Crit Ultrasound J. 2015 Dec. 7 (1):13. [Medline]. Bezerra AS, D''Ippolito G, Faintuch S, Szejnfeld J, Ahmed M. Determination of splenomegaly by CT: is there a place for a single measurement?. AJR Am J Roentgenol. 2005 May. 184(5):1510-3. [Medline]. [Full Text]. Goldstone J. Splenectomy for massive splenomegaly. Am J Surg. 1978 Mar. 135(3):385-8. [Medline]. Laws HL, Burlingame MW, Carpenter JT, Prchal JT, Conrad ME. Splenectomy for hematologic disease. Surg Gynecol Obstet. 1979 Oct. 149(4):509-12. [Medline]. Musser G, Lazar G, Hocking W, Busuttil RW. Splenectomy for hematologic disease. The UCLA experience with 306 patients. Ann Surg. 1984 Jul. 200(1):40-5. [Medline]. [Full Text]. Wilhelm MC, Jones RE, McGehee R, et al. Splenectomy in hematologic disorders. The ever-changing indications. Ann Surg. 1988 May. 207(5):581-9. [Medline]. [Full Text]. Flowers JL, Lefor AT, Steers J, et al. Laparoscopic splenectomy in patients with hematologic diseases. Ann Surg. 1996 Jul. 224(1):19-28. [Medline]. [Full Text]. Wang KX, Hu SY, Zhang GY, Chen B, Zhang HF. Hand-assisted laparoscopic splenectomy for splenomegaly: a comparative study with conventional laparoscopic splenectomy. Chin Med J (Engl). 2007 Jan 5. 120(1):41-5. [Medline]. [Full Text]. Subhasis RC, Rajiv C, Kumar SA, Kumar AV, Kumar PA. Surgical treatment of massive splenomegaly and severe hypersplenism secondary to extrahepatic portal venous obstruction in children. Surg Today. 2007. 37(1):19-23. [Medline]. Owusu-Ofori S, Remmington T. Splenectomy versus conservative management for acute sequestration crises in people with sickle cell disease. Cochrane Database Syst Rev. 2015 Sep 7. 9:CD003425. [Medline]. Lavrenkov K, Krepel-Volsky S, Levi I, Ariad S. Low dose palliative radiotherapy for splenomegaly in hematologic disorders. Leuk Lymphoma. 2012 Mar. 53(3):430-4. [Medline]. Bruns F, Bremer M, Dettmer A, Janssen S. Low-dose splenic irradiation in symptomatic congestive splenomegaly: report of five cases with literature data. Radiat Oncol. 2014 Mar 27. 9:86. [Medline]. [Full Text]. Zaorsky NG, Williams GR, Barta SK, Esnaola NF, Kropf PL, Hayes SB, et al. Splenic irradiation for splenomegaly: A systematic review. Cancer Treat Rev. 2017 Feb. 53:47-52. [Medline]. Mistry PK, Lukina E, Ben Turkia H, Amato D, Baris H, et al. Effect of oral eliglustat on splenomegaly in patients with Gaucher disease type 1: the ENGAGE randomized clinical trial. JAMA. 2015 Feb 17. 313 (7):695-706. [Medline]. Kawanaka H, Akahoshi T, Kinjo N, et al. Technical standardization of laparoscopic splenectomy harmonized with hand-assisted laparoscopic surgery for patients with liver cirrhosis and hypersplenism. J Hepatobiliary Pancreat Surg. 2009. 16(6):749-57. [Medline]. Xu WL, Li SL, Wang Y, Shi BJ, Li M, Li YC, et al. Laparoscopic splenectomy: color Doppler flow imaging for preoperative evaluation. Chin Med J (Engl). 2009 May 20. 122(10):1203-8. [Medline]. Shaw JH, Print CG. Postsplenectomy sepsis. Br J Surg. 1989 Oct. 76(10):1074-81. [Medline]. Kim DK, Riley LE, Harriman KH, Hunter P, Bridges CB, Advisory Committee on Immunization Practices. Recommended Immunization Schedule for Adults Aged 19 Years or Older, United States, 2017. Ann Intern Med. 2017 Feb 7. 166 (3):209-219. [Medline]. [Guideline] Davies JM, Barnes R, Milligan D, British Committee for Standards in Haematology. Working Party of the Haematology/Oncology Task Force. Update of guidelines for the prevention and treatment of infection in patients with an absent or dysfunctional spleen. Clin Med (Lond). 2002 Sep-Oct. 2 (5):440-3. [Medline]. Davies JM, Lewis MP, Wimperis J, Rafi I, Ladhani S, Bolton-Maggs PH, et al. Review of guidelines for the prevention and treatment of infection in patients with an absent or dysfunctional spleen: prepared on behalf of the British Committee for Standards in Haematology by a working party of the Haemato-Oncology task force. Br J Haematol. 2011 Nov. 155 (3):308-17. [Medline]. This patient has a splenic abscess due to pneumococcal bacteremia. Note that the massively enlarged spleen is readily visible, with minimal retraction in the left upper quadrant. Resected specimen from the patient in the previous image. Note the discrete abscesses adjacent to normal parenchyma. The margins of this massive spleen were palpated easily preoperatively. Medially, the 3.18 kg (7 lb) spleen crosses the midline. Inferiorly, it extends into the pelvis. A massive spleen that was removed from an elderly woman with lymphoma.